The governor’s brother and “best dude,” Jeff Shumlin, poured champagne and “best daughters Olivia and Becca cheered us on.” Shumlin’s sister-in-law Evie Lovett officiated. Shumlin and Hunt are now “off for a long weekend of sun and beach.” They return on Monday, Dec. 21. Hunt and Shumlin were engaged in June. The couple plan to live in Westminster West, a town in Southern Vermont, where they both grew up, after the governor retires from his third term in office January 2017. Hunt is an undergraduate at Mount Holyoke College and has been the governor’s companion since he took office in 2011, according to Scott Coriell, Shumlin’s press secretary. Hunt, an artist and landscape gardener, has been described as shy and uninterested in politics. Recently, she began appearing at the Statehouse and political events. Until last October, the governor kept his relationship with Hunt a secret. 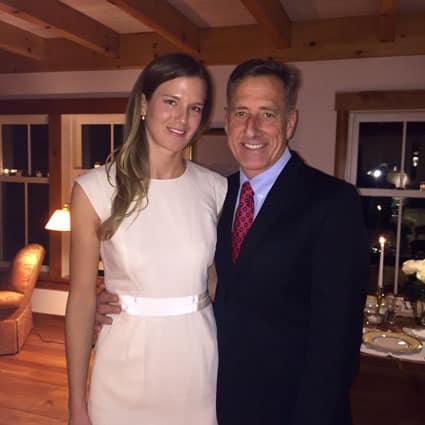 Shumlin is divorced from Deborah Holway, his second wife. His first wife was Preston Parsons.